For more than three decades, the south bank of Lake Wörthersee in Austria has become the home for GTI fans from around the world. And it has long since become a tradition for Volkswagen – the inventor of the GTI – to present an automotive surprise for the 200,000 visitors. This year, Volkswagen is topping all previous 33 Lake Wörthersee GTI events with the double world premiere of two breathtaking Golf GT models planned for the near and medium-term future: the Golf GTI Clubsport and the Golf GTE Sport. As a concept car, the Golf GTE Sport with its carbon body, completely new cockpit design, an “electric propshaft” and 400 PS plug-in hybrid drive shows what is possible when designers and engineers catapult the GT idea a long way into the future. By contrast, the Golf GTI Clubsport – also presented as a concept car – offers a glimpse at the 265 PS anniversary model which will mark the 40th birthday of the Golf GTI next year. 5. Golf GTI Clubsport debuts with motor racing bucket seats and numerous exclusive equipment details5. Ringing in a new era: with the Golf GTE Sport presented as a world premiere at the legendary GTI event at Lake Wörthersee on 14 May 2015, Volkswagen is catapulting the GT tradition into the future. The high-tech Golf that is largely made of carbon is powered by a total of three motors – combined in a plug-in hybrid drive with system power of 295 kW / 400 PS. The concept car breaks down traditional barriers between road and motorsport vehicles. Its progressive hybrid system in combination with the high-tech all-wheel drive, a lightweight body, optimum aerodynamic downforce, precision running gear based on the design of the current Golf GTE, a new motor racing cockpit (including visualisation of the racing line) and an unusual seating concept (two monocoque-like interior areas) enable breathtaking performance on the racetrack. At the press of a button, however, the concept car is able to cover a distance of up to 50 kilometres on electric power alone and hence with zero emissions. World Rally Car TSI engine. The 1.6 litre TSI (turbocharged direct-injection engine) adapted from the superb Polo R WRC (World Rally Car) is accommodated in the engine compartment at the front of the car. It delivers 220 kW / 299 PS and maximum torque of 400 Nm. Volkswagen has already won the World Rally Championship twice with this engine. In the Golf GTE Sport the four-cylinder masterpiece is assisted by two electric motors. The engineers positioned the first electric motor at the front (in the housing of the 6-speed dual-clutch gearbox). It develops 85 kW / 115 PS and maximum torque of 330 Nm. The second electric motor is located at the rear with the same power output but torque of 270 Nm. The total torque of the drive system is 670 Nm. Whenever possible, the concept car is powered solely by electricity without producing any emissions. In sporty “GTE mode” all three motors work together, giving the all-wheel-drive Golf GTE Sport a standstill to 100 km/h time of 4.3 seconds and a top speed of 280 km/h. 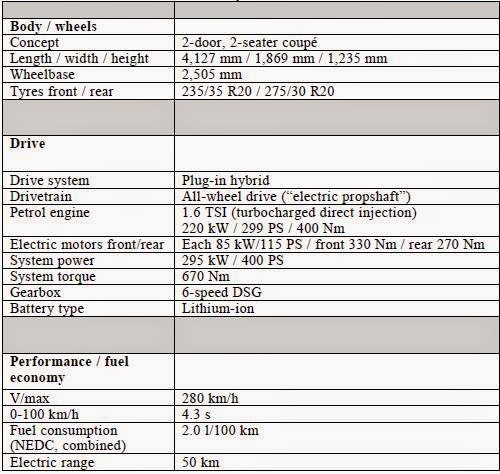 In the NEDC cycle for plug-in hybrid vehicles the sports car consumes just 2.0 l/100 km/h. Two-seater race car. The driver and passenger board the two-seater interior of the Golf GTE Sport through doors that swing right up in the style of the XL 1. The doors extend a long way up into the roof and down into the side sills, resulting in convenient boarding when they are opened upwards. The interior in carbon and microfiber consists of two completely separate areas for the driver and passenger. Like in motorsport vehicles, they sit quite a long way to the back on racing bucket seats with five-point belts. Accordingly, the steering column that is entirely clad in carbon projects a long way into the interior where it appears to float – a further characteristic feature of a rally car or touring-car racer. The functional elements are operated via controllers and buttons in the cocoon-like interior trim. The gearbox of the Golf GTE Sport can also be operated manually with shift paddles on the motorsport steering wheel. Instruments on three levels. The instruments featuring a completely new design have been specially coordinated for the configuration of the driver’s workspace. The Volkswagen interface designers opted for three transparent displays arranged behind one another on which all relevant information is displayed. On the smallest display at the front (closest to the driver) information such as the selected gear and the recuperation status is displayed; information that is only sporadically checked from the corner of the eye whilst driving. The centre display has secondary yet more complex information such as the power currently delivered by the drive (power meter) and the boost intensity of the plug-in system (electric boost). Information such as the current speed and the range are constantly in the driver’s field of vision on the third and largest display. In addition, in “GTE mode” not only is the current lap displayed (e.g. 9 of 16), but there is also a virtual indicator of the ideal driving line – valuable assistance for safe and fast driving on complex racetracks such as the aforementioned Nürburgring north loop. Ergonomic perfection. The clearly arranged multifunction switch for starting and stopping the hybrid drive and controlling the 6-speed DSG is ideally positioned to the right of the driver for easy access. Right next to it there is a control panel for further vehicle functions; these include a button for activating a fire extinguishing system similar to that used in motorsport. Furthermore, the passenger is also supplied with data via a display in his interior segment. In “Info Mode” the current speed, the gear currently engaged and the engine speed can be displayed. If the passenger switches to “Data Mode” he can call up the vehicle acceleration and lateral force figures (gforces). It is not only the use of carbon, but rather a general lightweight design that saves weight in the interior. For example, the loops for opening the doors are made of the same synthetic fibre as the five-point belts. Moreover, extremely elaborate ergonomics prevail in every detail. The operating mode switch for selecting "EMode", "GTE-Mode" or "Hybrid-Mode", for example, is situated in the roof, like in a jet plane. Side profile. The design concept of the Golf GTE Sport manifests itself in the car's striking silhouette. Here, Volkswagen is continuing the idea of C-pillars with a two-level design originating from the 2007 Golf GTI W12-650, which has been constantly further perfected in various concept cars. On the Golf GTE Sport that is now being presented, this C-pillar concept, which is unique worldwide, has reached a degree of perfection that allows it to leave the show car stage and – as a design vision – bridge the gap to the Golf GT models of the future. The basic styling of these pillars (like the string of a bow taut with an arrow) follows the unmistakable Golf design, but at the same time feature some completely new C-pillar details: behind the level visible from outside a second one opens up. Rear. Never before has Volkswagen realised such a charismatic and sporty rear for a Golf. Here, too, the two levels of the C-pillars are a defining stylistic feature giving the Golf GTE Sport a very wide and powerful appearance from the rear. The extended outer levels of the C-pillars at the rear – like the tail unit of an aeroplane – elongate the car together with the large roof spoiler. Typically Golf: the striking tailgate with a vertical downward angle at the level of the redesigned LED rear lights. At the top, the tailgate is limited by a black carbon roof spoiler – a wing that seems to hover in front of the tailgate at a distance of a few millimetres to the roof. The C-pillars that taper at an angle to the rear and the bumper merge into one another, with the latter projecting far above the line of the tailgate. As an imaginary continuation of the side strip made of visible carbon (above the sill), the top edge of the bumper also features visible carbon. Below this is an area painted in the body colour (with air outlets on the outside). The last level is a large diffuser made of visible carbon with the splitter that is also continued here. The round stainless steel trims of the twin-pipe exhaust system are integrated in the middle of the diffuser. E-Mode – setting off on electric power. No Golf has ever had three motors before. But this one does. As described at the beginning, the combustion engine fitted by Volkswagen is a turbocharged 1.6-litre four-cylinder direct-injection engine (TSI) that produces 220 kW / 299 PS of power and a maximum torque of 400 Nm. The electric components consist of the lithium-ion battery and two electric motors. The front electric motor is integrated in the housing of the 6-speed DSG (DQ400E). Both electric motors have a power output of 85 kW. The total available system power is 295 kW / 400 PS. If necessary, the system drive power can be distributed to all four wheels thanks to the rear electric motor and an “electric propshaft”. In normal operation the Golf GTE Sport drives just as quietly as the production Golf GTE that is already marketed. In “E-Mode” it is setting off purely electrically. In this case the concept car uses the battery that can be charged externally (but also whilst driving) to cruise without producing any emissions. It can cover up to 50 kilometres on a battery charge. When a defined minimum battery charge is reached, the 1.6 TSI is automatically switched on and the Golf GTE Sport drives in “Hybrid” mode. As soon as the battery reaches a certain charge level again, “E-Mode” can be reactivated at any time via a switch in the overhead console. In “E-Mode”, the rear axle electric motor is first and foremost responsible for propulsion. When high demands are made on performance, the front electric motor is also activated to provide support. Hybrid mode – silent coasting. As soon as the drive system or the driver deactivates “E-Mode”, the Golf GTE Sport becomes a classic full hybrid with regenerative braking charging the battery and automatic utilisation of the right combination of TSI and/or electric motors according to the specific drive situation. When the driver releases the accelerator pedal, and the battery is sufficiently charged, all drive sources are shut off. This is referred to as “coasting”. If the driver releases the accelerator pedal or brakes, and the battery is insufficiently charged, the two electric motors operate as generators and charge the lithium-ion battery with the energy recovered from braking. With the dual mode “Battery Hold” or “Battery Charge” the battery’s energy content can be deliberately kept constant by the driver (“Hold”) or increased (“Charge”). When the 1.6 TSI engine is the sole source of propulsion, the concept car is a pure front-wheel drive car. GTE-Mode – the power of three hearts. The switch on board theGolf GTE Sport that is most important for dynamic performance is located in the overhead console. It bears the letters “GTE”. When the driver operates this switch, the character of the Golf GTE Sport's drivetrain changes drastically in an instant because now the full system power of 400 PS is available. The turbocharged 299 PS petrol engine alone delivers immense propulsive power, and at this high level the electric drive components of the Golf GTE Sport assume an additional boost function. The boost effect is so strong that the drive unit would also perform well if used in professional touring car races: the Golf GTE Sport sprints to 50 km/h in 1.8 seconds, reaches 100 km/h in 4.3 seconds, and the maximum speed permitted in Austria, i.e. 130 km/h, in 6.5 seconds. On German motorways, the concept car reaches 200 km/h in 15.9 seconds. In “GTE-Mode” all four wheels of the Golf are driven.